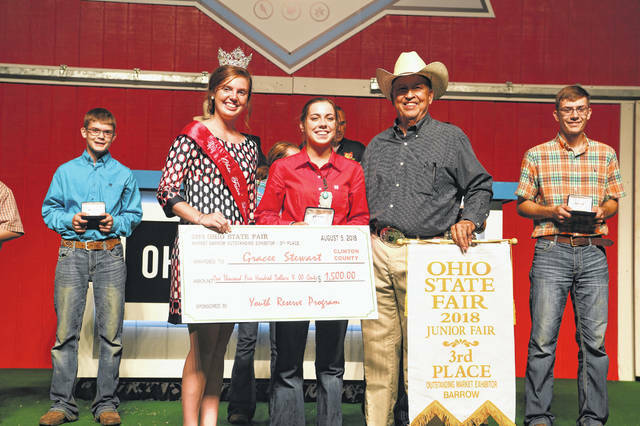 FFA member Gracee Beth Stewart of Clinton County, also a member of Blue Ribbons Kids 4-H Club, was awarded 3rd Overall Swine Outstanding Market Exhibitor at the 2018 Ohio State Fair. She also earned 14 year-old Overall Outstanding Market Exhibitor, 2nd in 14 year-old Skillathon, and 9th Overall Outstanding Breeding Gilt Exhibitor. Gracee attended the Sale of Champions at the fair to be awarded her overall check and belt buckle for her 3rd Overall Exhibitor and Overall Age Group earnings. The daughter of Billy and Jenny Stewart is a sophomore at Miami Trace High School, where she is in FFA.